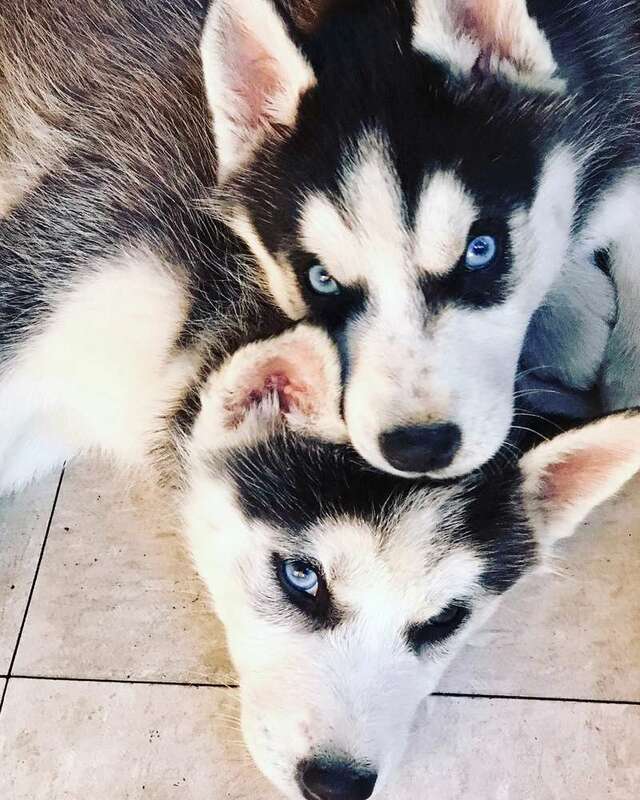 Evening everybody, I am new here and after putting down our beautiful golden retriever almost 2 years ago, we adopted two huskies. They are 2 sisters and they've only been home for 2 days and I am feeling a bit overwhelmed. I feel like a horrible parent as I haven't even had a chance to name them but I will definitely do so very soon. I was only planning on adopting one but I did not want to separate them from each other. I have a little experience with this breed as I had a brother who had two of his own but they have passed away for some time now. I am here to refresh my memory and know what it's like to be a brand new mommy again. Hi Laura and welcome to the Husky Madness!! Ooooo, two at one time - you are a glutton for punishment, aren't' you?? From your picture, they aren't little puppies but they aren't adults either, how old are they? They make a beautiful pair, and I wouldn't have wanted to separate them either. I sorta had to laugh at "haven't even had a chance to name them", you're not alone there. I've always either kept the name the dog had or let them name themselves by something they do. My last lab was just a great companion but I couldn't come up with a name that worked. An Indian friend at the local convenience store kept talking about her as "Kalah" which she responded to, so she became Kalah - which is Hindi for black - he was calling her, of all things, "blackie". Don't worry about it, they'l come to food and you'll come up with a name for them eventually. My names for my two cats are still "the black cat" and "the white cat" ... what can I say. Welcome to the forum. I don't envy you tackling two puppies. Two husky puppies no less. I find that dogs name themselves if you give them time to. Welcome aboard! 2 Huskies? Oh boy, I hope you are ready for a wild ride! Cruise about the forums and read away, and if you have any questions, you have a whole bunch of experience floating around here. Ask away! beautiful girls, its so cool that they got to stay together. 2 huskies at one time its going to be a very crazy roller coaster. welcome aboard, the place has amazing fur baby experienced people. They are beautiful. You are going to have so much fun with them. Just remember to out stubborn your huskies. That is my useful tip to you.